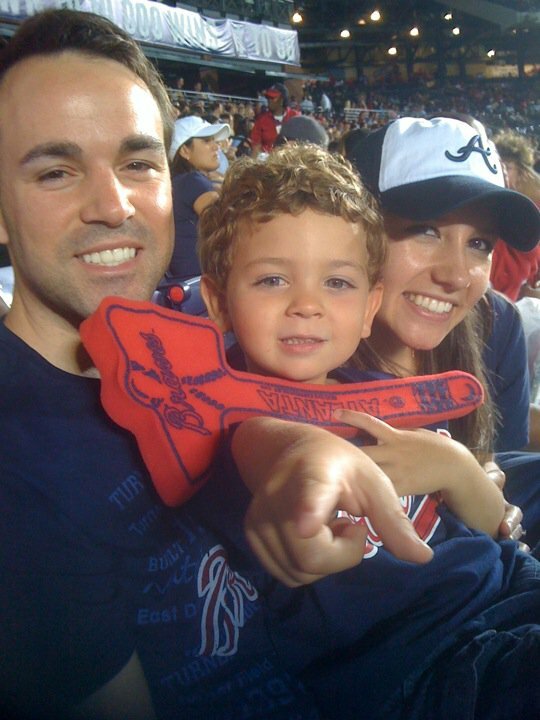 Chris and Jen with their nephew and Honored Hero, Chase. By this time of year, most New Year’s Resolutions have probably already been forgotten about. This is not the case for Brookhaven resident Jen Lesshafft. She is determined to follow through with her resolution and run at least one 5k a month. She’s showing no signs of slowing down. In fact, she’s gearing up for one of her most meaningful races to date –The 7th Annual Big Peach 5K Run/Walk to benefit The Leukemia & Lymphoma Society. Her husband, Chris, has been running for a few years and she was getting tired just waiting for him at the finish line. As a way to stay fit and spend more time with her husband, Jen decided she was going to start running, too. Chris and Jen set their resolutions. But that wasn’t enough for them. Not only are they shooting for one 5k a month, they also set a long-term goal to run at least one 5k in every state. So far, they’ve completed races in Georgia, Tennessee, South Carolina and North Carolina. They’ll be repeating Georgia on May 5 when they run the Big Peach 5k. Jen and Chris have had a personal mission connection to The Leukemia & Lymphoma Society since September 2008 when their nephew, Chase, was diagnosed with Pre-B Cell lymphocytic leukemia when he was only 18 months old. Jen and Chris have been training for the Big Peach 5k by running through their hilly Brookhaven neighborhood. Starting and finishing in Brookhaven, they have mapped out a 3.1 mile course that takes them all throughout neighborhood. Although the course can prove challenging to a new runner, Jen keeps pushing through. The Leukemia & Lymphoma Society created a program that makes it easy for people like Jen and Chris who want to run for a good cause. 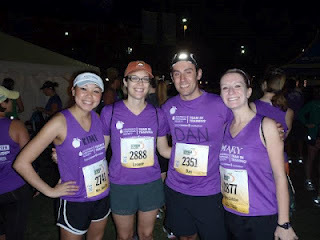 Team In Training is an endurance sports training program that benefits the Leukemia & Lymphoma Society. As an official Team In Training event, the Big Peach 5k offers participants the opportunity to give back, all while running a fun, 5k. To learn more about the Leukemia & Lymphoma Society’s Team in Training program, please visit the Team in Training website, www.teamintraining.org/ga. The 7th Annual Big Peach 5K Run/Walk to benefit The Leukemia & Lymphoma Society takes place May 5th (Cinco de Mayo) at 8:00pm. Registration is now open. Participants can register on-line or by visiting any of the Metro Atlanta Big Peach Running Co. stores by Wednesday, May 2nd. All proceeds from the race go to benefit The Leukemia & Lymphoma Society. First of all THANK YOU to everyone who supported me along the way to achieve this goal! I wouldn't have been able to make it without the emotional support throughout the training process, the generous donors who helped me raise money for such a great cause, and the amazing coaches I had along the way. All of you helped me out so much and I am so thankful for that!! 1. Always pack your bag the night before and double check that you have everything! For race weekend my parents flew down to provide additional support for my first marathon! I had to work later than expected that day so I decided to just meet them down at the hotel right away and I'd go back to the apartment later that evening to pack my bag for the weekend. After walking down to the expo to get our stuff we decided to come back and take a quick nap and by the time that was over we forgot an important detail of Atlanta: TRAFFIC. After trying to coordinate with my husband on how we'd get him downtown, we decided he'd pack my weekend bag and if he forgot anything I'd go back sometime on Saturday. I went through all of the things I could possibly need and thought I had it all. Unfortunately on race morning I forgot one important element...DEODORANT. I went into a panic at 5:30 in the morning and couldn't imagine what I was suppose to do?! I went with the only option I had...use my husband's. It didn't have a pretty smell to it but hopefully it would do the job. At this point I realized how important this rule is! Prior to the start of the race the TNT Publix team met up for some last minute information and to head to our corrals together. It was wonderful seeing all of my TNT friends and knowing that all of our training and fundraising came down to this day. We decided to start all together and remembered that we needed to pace ourselves especially at the beginning. Finally at 7:03AM our wave crossed the starting line and we were off. As we began the race it was amazing to see all of the crowd support and get to share this incredible moment with other people. For the group I was running with, our overall goal was to maintain a comfortable pace for the entire race. After the awe of the start of the race had worn off we got into our groove and it almost seemed like any other GTS run. We started talking about our daily lives, what was next, and interesting things we saw along the way. Next thing you know we were passing the half/full marathon split a little after mile six and it seemed like no time had passed. We were consistently averaging 10:45 a mile and it was like clockwork. We truly had settled into our routine and it made the time go by quickly. 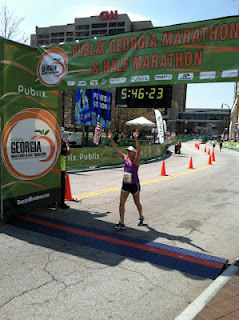 As I passed the halfway point I was feeling great! While I was trailing back a bit from my initial starting group, I had really gotten into a rhythm. I figured I'd be on track for a 4:30 marathon. My husband met me around this point and he too was surprised how quickly I had reached mile 13. I continued along the course and honestly just ran along with no problem and enjoyed the sites around me. Unfortunately that feeling began to change around mile 19. At this point the pain in my hip and knee started to increase and I had hoped it wasn't going to give out on me now. After talking to a coach about my pain, I decided I could use a short walking break to give my IT band a moment to regather itself and then start up again. From that point on it was run/walk and the pain continued to grow (as did the number of hills). I was determined to make it to the finish line! I realized I could no longer run without causing more injury to my leg but I was going to get my medal and make it to the end. It was so frustrating knowing how well I was pacing and how much training I had put into this event but at the end of the day I knew I had to really listen to my body and its injury. While I was forced to walk to the finish line, the encouragement and support I received from spectators and TNT members/coaches/supporters was incredible! I'm not quite sure why, but all of the photographers decided to appear AFTER mile 23, you know the point where I was limping and fighting tears. 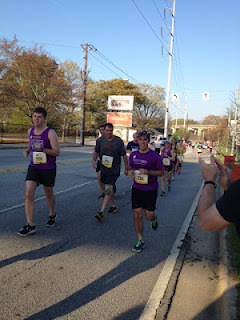 If you go to marathonfoto.com and look at my pictures from the race (Bib 2741) you would think I was just taking a leisurely stroll with a smile on my face but I do promise you I was in a lot of pain; I wasn't going to let that show on the camera :) I realize I had so much to be proud of! I had raised over $1,000 to help find cures and better treatments for leukemia and lymphoma. While I was in a lot of pain, it was only temporary in comparison to what those with cancer go through every day. These individuals are the real heroes who inspired me to make it to the finish line with a smile on my face knowing I was racing towards a cure! When I set out on this adventure almost five months ago I honestly wasn't sure if I would meet my fundraising goal much less make it to the finish line. I had never run more than four miles and honestly had never run continuously for more than 20 minutes. TNT changed all of this for me! Along the way I made great friends and achieved the unthinkable all while helping to raise money for a great cause! During the last mile all I could think about was my next marathon and how much I wanted to do it with TNT, so I have signed up for the Bank of America Chicago Marathon in October!! I really appreciate all of those who have followed my progress along the way! While training for this next event I will be facing a whole new factor - HEAT AND HUMIDITY. 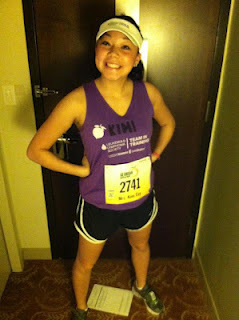 TNT participant Kimi Coy is currently training and raising funds to participate in Bank of America's Chicago Marathon in October 2012. 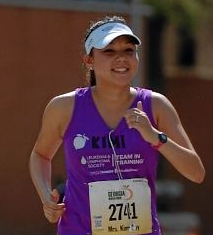 Kimi is a recent graduate out of the University of Colorado - Boulder and currently is a financial analyst with IBM.